When it comes to displaying your art, sculpture or paintings there is no denying that you know how to display your work at its best. 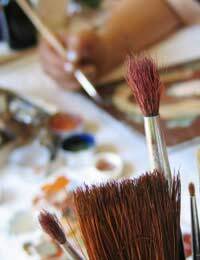 Therefore it makes sense to arrange to hold an open day for customers to visit your workshop, art suite or studios, watch you at work and purchase the products directly from you. There is nothing frightening about having an open day, you don't need to offer food or refreshments, you don't need to invite local dignitaries or even the press, you just need to let the public know that your studios are open on a certain day and time and they will come. Human nature dictates that they will visit you because people are curious and nothing holds the public's imagination more than a recluse artist in a studio painting away like mad. They not only want to view your work, they want to see if their image of a painter fuelled by madness and alcohol is correct, after all history states that it is the way artists are and Van Gogh did the most to prove the theory correct. Make sure that the public can have access to your work. People like to touch, to feel and get up close to artwork, especially if it is sculpture of a tactile nature. However, display notices that breakages must be paid for to deter parents from allowing Little Johnny playing with the artwork. There is no greater incentive for the visitors to be careful than the threat that it will hurt them in their pockets should they not take care when handling the artwork. Try to keep the space uncluttered to enable as many people as possible to wander around the displays and ensure that you are working in a place where they can easily stand and watch you create a masterpiece. Research has shown that a customer is more likely to buy a piece of artwork after they have seen you create one. It gives them a talking point and a memory that will give the artwork more meaning to them. Such as 'we bought this piece from a little art studio on our honeymoon after watching the artist paint one just like it'. People are more likely to part with their hard-earned cash if it offers more than making their room look pretty or matching their new colour scheme in the bedroom. As much as selling the art you need to sell yourself. It is vital that the visitors can engage in conversation with you, ask questions and feel as if they are important. Visitors that are ignored feel like intruders in your workspace or made to feel ridiculous for asking simple questions won't buy from you. Not matter how trivial their inquiries do your best to be friendly and answer as fully as you can. By ensuring the customer likes you is ensuring your half way towards making a sale. Try to put up posters or advertise in the press in plenty of time to give people chance to make arrangements to visit you, but try not to do it so early that people forget about the event. You may also find you do better if you do an 'open week' rather than a day as you allow more people to visit you. However, don't do it too often as people will no longer view it as special and you will loose that vital mystique that surrounds the working artist.